Cold temperatures didn't dampen festivalgoers enthusiasm for the second annual celebration. WATERVILLE — An Oakland grandmother was a bundle of Christmas spirit Saturday in Waterville for the second annual Joy to the Ville holiday celebration. 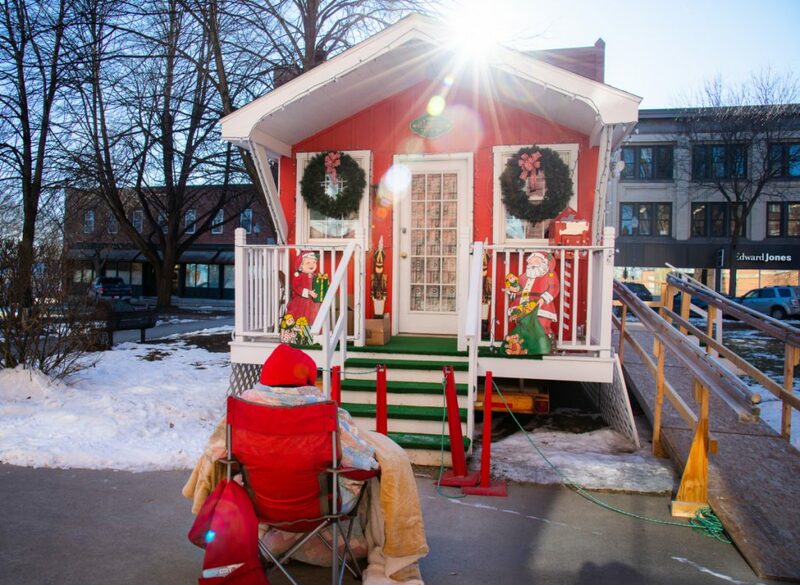 Wrapped in layers of fleece, quilts and blankets — hoodie and all — Mary-Anne LaMarre was literally a bundle herself, as she sat in a beach chair waiting for Santa to open Kringleville in Castonguay Square. 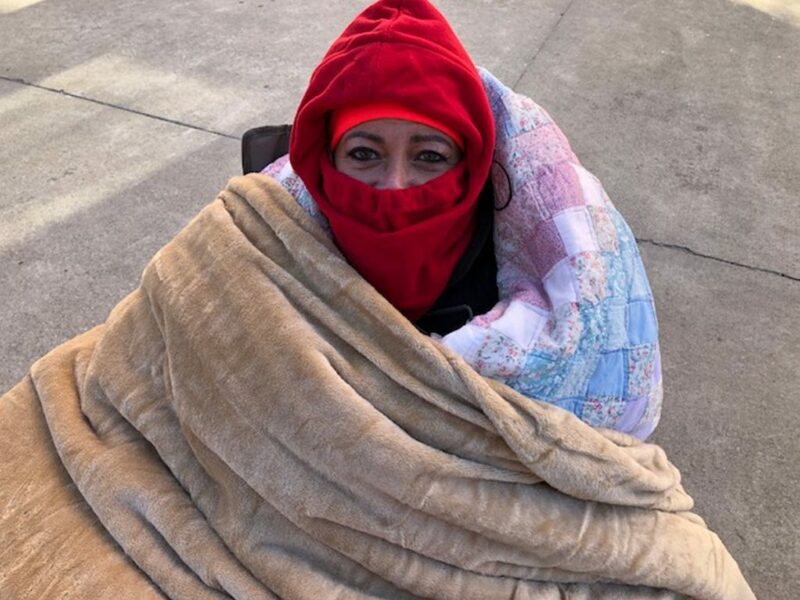 It was cold, too — 18 degrees outside by about 11:30 a.m., some 90 minutes before Kringleville was to open. Activities for the second annual event included a free family-friendly holiday film at Railroad Square Cinema, a free HD theater broadcast at the Waterville Opera House, free art activities with the Colby College Museum of Art at Common Street Arts, story time with special guests at the Waterville Public Library, shopping discounts, and deals and free goodies at local shops and restaurants. 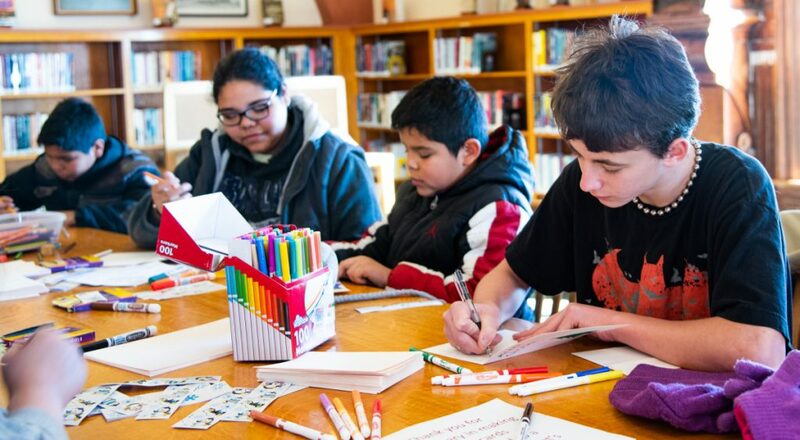 Volunteers at the Waterville Public Library made holiday cards for nursing home residents. 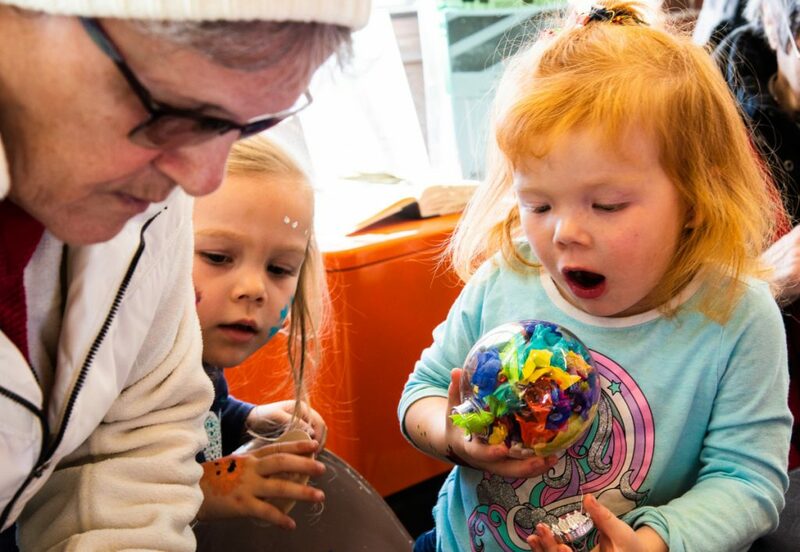 There was free holiday card and ornament making at Common Street Arts in their new location in the Hathaway building, among many other activities. The scene at the Loyal Biscuit Co. a pet food and toy shop on Main Street, was equally festive, with dogs on leashes leading their humans around the store looking for treats and a slug of water from an available bowl on the floor. There was a cat in the window, inside, ignoring the goings on. Goodies included pet-friendly eggnog, which according to store manager Adam Balvo, has been enjoyed by many visiting pooches. He said the store was offering 15 percent off all non-food items Saturday — toys, treats, harnesses and litter. It’s made from goat’s milk, eggs, honey and cinnamon. 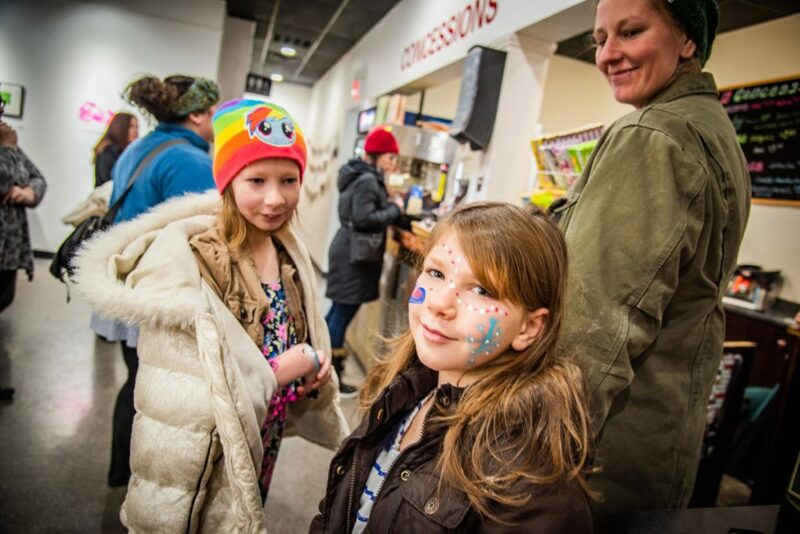 Nikki Busmanis, of Waterville, was shopping for dog toys and other items Saturday with her daughter, Sadie Williams, 11, of Waterville, and her friends, Leah Brann, 12, of Oakland and Dovelyn Russell, 11, of Sidney, for the Joy of the Ville. Daughter Sadie said they tried to stop at as many shops and stores as they could. “We went to Holy Cannoli to decorate cookies, then we went to Itali-ah (restaurant and market) and got melted gellato,” she said. Over at The Center on Main Street, where Colby College and Waterville Creates! 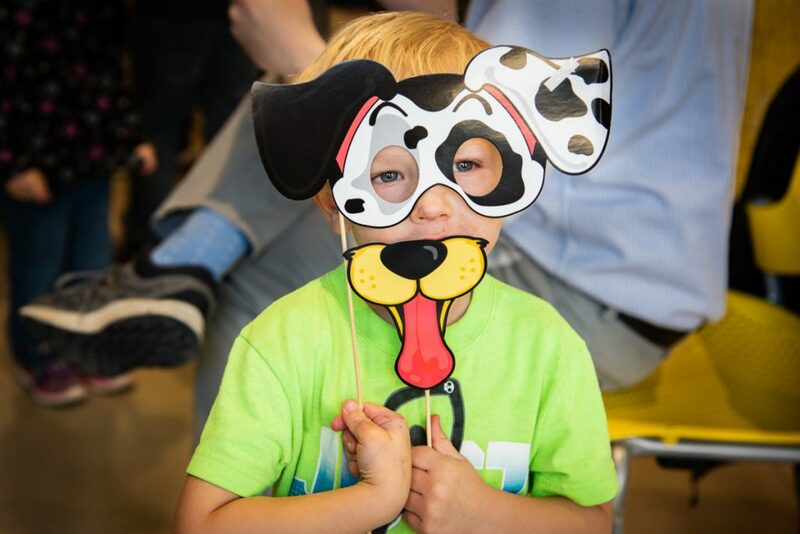 are working to transform the building into a thriving art and film center, Emilie Knight, of Fairfield, the community programs coordinator for the Children’s Discovery Museum, was setting up a pop-up shop for the festivities. The display includes a giant geo-board, where children can draw with “stretchy string,” ball ramps and other building activities and interactive, liquid tile mats. The museum plans to relocate from Augusta to Waterville, Knight said. “Waterville has a lot going on with a really dynamic downtown and we’re excited to be part of that,” she said. Free holiday green screen “Winter Fun Photos” were offered at the Chase Forum in the Alfond Commons on Main Street. The finished photos are to be posted on the Waterville Creates! Facebook page.